'Blitz' (John Weiler, R. 1988). Seedling# 84-50-1. SDB, height 10" (25 cm), Early to late bloom and rebloom. Standards full yellow; falls velvety dark yellow; light yellow beard; slight sweet fragrance. Seedling# 81-19-3: ((('Ruby Contrast' x 'Little Blackfoot') x (((seedling# 70-95-3RE: 'Brighteyes' x 'Grace Note') x 'Bronze Babe') x ('Cartwheel' x seedling# 70-95-6))) x 'Pink Amber') X seedling# 82-3-4RE: (((('Yellow Wave' x seedling# 70-95-2RE) x ('Cartwheel' x seedling# 70-95-1 RE)) x 'Chariots') x ((seedling# 70-95-3RE x 'Gingerbread Man') x 'Stockholm')). Rialto Gardens 1988. Honorable Mention 1992. From AIS Bulletin #269 April 1988 Introducing BLITZ (Weiler 88) SOB 10" E-L & RE. 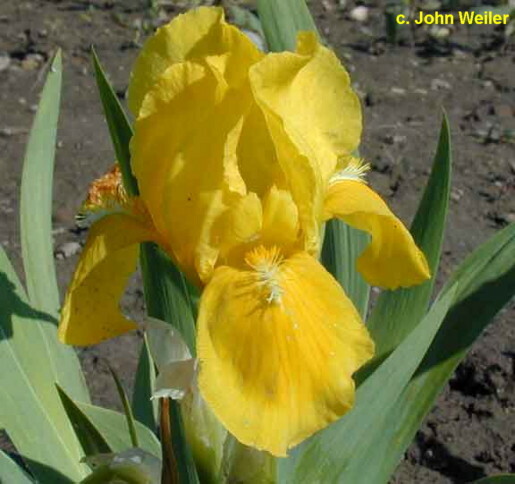 The earliest to rebloom here, standards are full yellow, falls intense golden velvet with light yellow beards. Heavy bloom spring, some repeat & abundant rebloom September-October. 84-50-1: (((Ruby Contrast x Little Blackfoot) x (((Brighteyes x Grace Note) x Bronze Babe) x (Cartwheel x (Brighteyes x Grace Note))) x Pink Amber) X ((((Yellow Wave x (Brighteyes x Grace Note)) x (Cartwheel x (Brighteyes x Grace Note)) x Chariots) x ((Brighteyes x Grace Note) x Gingerbread Man) x Stockholm)). $10.00. Rialto Gardens.